How Can We Forget Krishna? Q: “Falling down” from the spiritual world is quite a strange idea, but if we never met Krishna how to explain our longing for Him? I feel, everyone longs for Him only, as nobody is happy here. Longing for Krishna is actually a very rare thing that only the most advanced bhakti-sādhaka’s achieve. It is not something that everyone intrinsically has. Krishna says that even to comprehend god at all is very rare (manuṣyānām sahasreṣu…). And he says that of all those few who do comprehend god, those who can conceive of god in a personal way are still more rare (vasudeva sarvam iti sa mahātmā sudurlabha). Of all those who can conceive of god in a personal form, those who want to develop a devotional relationship with him are even still more rare (yoginām api sarveśaṁ…). Explaining the Śrīmad Bhāgavata, Śrī Rūpa, in Bhakti Rasāmṛta Sindhu, explains that longing for Krishna (āsakti) is the most advanced stage of sādhana. So I do not agree that “everyone longs for Krishna.” Practically no one even knows what or who Krishna is, what to speak of has a real, sincere longing for him. Q: Then what do we feel? What is that hole in the heart that cannot be filled by any amount of material sense gratification? We are kṛṣner nitya-dāsa. This means that our very constitution is meant to experience Krishna. We are consciousness by nature (jñāna-mātra, svayaṁ-jyoti pratyag-dhāma), and consciousness always longs for an object worth being conscious of. Krishna is the supreme object and subject of consciousness (adhokṣaja, govinda, kṛṣṇa, etc). So we long to fulfill our constitutional potential, of experiencing the most deeply fulfilling object of consciousness. We do not exactly know what that object is. This is why we search around for a million things. But Krishna manifests the Veda to help us discover him, the true supreme object of consciousness (jñeya). 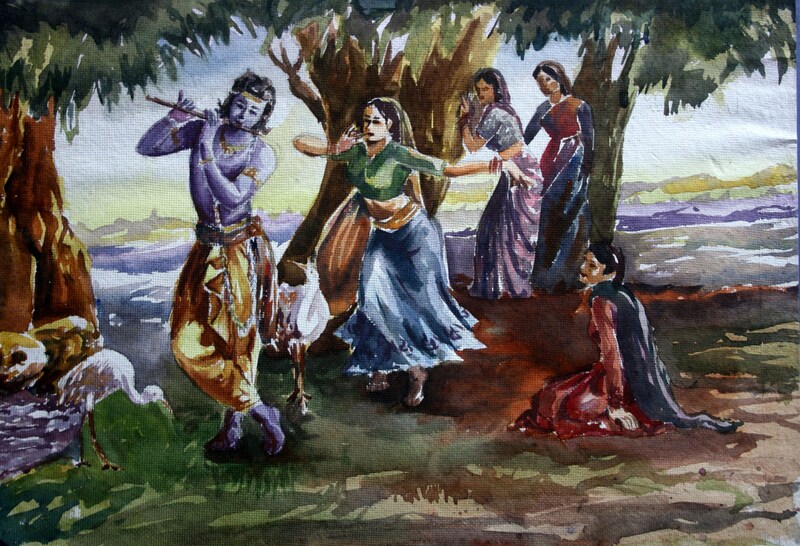 As you mentioned, the idea of leaving a relationship with Krishna is too odd. Because if we could leave it, it must not be fully satisfying and engrossing, therefore it must not after all be the param-jñeya (supreme objective of experience), and Krishna must not be “govinda” or “adhokṣaja” or “kṛṣṇa” etc. Therefore this concept is not acceptable. Śrī Jīva and the other founding ācāryas of Gauḍīya Vedānta clearly never present such a concept. They present the concept that we are anādi-bhagavād-ajñāna – we have never experienced Bhagavan – because we were instead fascinated by the qualities of māyā (yaya sammohita jīva) as a result of our unique and causeless individual nature and disposition. We are generally happy with māyā except when we do not cooperate with her rules and come under the influence of negative karma. But this in itself provides a clue that this happiness is not perfect for us. Krishna provides the Veda to give us a way to know him and establish a real relationship with him, the Supreme Object of Love and Joy. (anarthopaśamam sākṣāt and the next verse). Previous “Krishna Doesn’t Need Me, He Already Has Radha”? Prabhuji does that mean the soul has never been in any relationship with Krishna? Or in other words, it has never been to the spiritual world?